In this controversial book, psychologists Barry Duncan and Scott Miller, cofounders of the Institute for the Study of Therapeutic Change, challenge the traditional focus on diagnosis, "silver bullet" techniques, and magic pills, exposing them as empirically bankrupt practices that only diminish the role of clients and hasten therapy's extinction. Instead, they advocate for the long-ignored but most crucial factor in therapeutic success-the innate resources of the client. 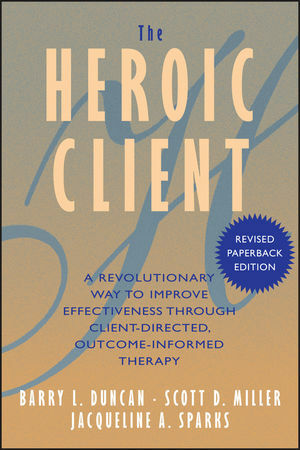 Based on extensive clinical research and case studies, The Heroic Client not only shows how to harness the client's powers of regeneration to make therapy effective, but also how to enlist the client as a partner to make therapy accountable. The Heroic Client inspires therapists to boldly rewrite the drama of therapy, recast clients in their rightful role as heroes and heroines of the therapeutic stage, and legitimize their services to third-party payers without the compromises of the medical model. Barry L. Duncan is cofounder and codirector of the Institute for the Study of Therapeutic Change and in private practice in Coral Springs, Florida. Scott D. Miller is cofounder and codirector of the Institute for the Study of Therapeutic Change, in Chicago, Illinois. Jacqueline A. Sparks is assistant professor of marriage and family therapy, Department of Human Development and Family Studies, at the University of Rhode Island. Foreword to the Revised Edition (Bruce E. Wampold). Foreword to the First Edition (Larry E. Beutler). 1. Therapy at the Crossroads. 2. The Myth of the Medical Model. 4. Becoming Outcome Informed with Lynn Johnson, Jeb Brown, and Morten Anker. 5 The Client’s Theory of Change with Susanne Coleman, Lisa Kelledy, and Steven Kopp. 6 The Myth of the Magic Pill with Grace Jackson, Roger P. Greenberg, and Karen Kinchin. Epilogue: A Tale of Two Therapies. I. A First-Person Account of Mental Health Services (Ronald Bassman). II. Consumer/Survivor/Ex-Patient Resource Information (Ronald Bassman). III. Five Questions About Psychotherapy. IV. Outcome Rating Scale and Session Rating Scale; Experimental Versions for Children.